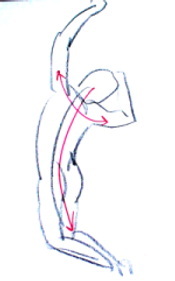 Gesture drawing, is a valuable exercise for learning how to see and draw. Many art schools offer classes where students draw from a live human model. The poses that these models strike are usually only held for a short time. Students only have time to draw a quick sketch that catches a gesture or a motion without much concern for proportion, perspective, or mistakes. As a result, these drawings tend to feel more dynamic and spontaneous. It is a fun and non-threatening way to draw. 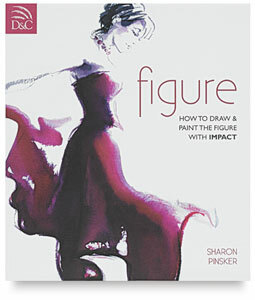 Use it as a diversion from the tighter drawing exercises that all artists have to work their way through. All you need to get started, is a large sheet of newsprint—preferably at least 14 by 17 inches ( 35cm by 43 cm) and a few 2B, 3B, or 4B pencils. Hard pencils make it more difficult to lay down masses where needed. You can also use an ink pen, a marker, or a felt tip pen if you prefer. Eraser? Nope, you don't need one for this exercise. Later on, if you want to, you can use an eraser to clean off unwanted lines. For now, because your concern is in trying to quickly capture the essential features and basic movement or action of the subject, don't worry about fine details or making corrections. First observe the largest features of your subject and quickly note the overall movement or direction of the object. Capture the big lines or “frame” that encompasses the whole object. 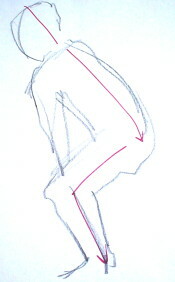 For example, in a gesture drawing of a figure, draw a “stick figure” with a curvy spinal cord. For fluid-looking movement, make the lines rounder. To create tension and add more excitement, use angular lines. With an inanimate object, find the big shape, or shapes, that make it up. Ask yourself how it fits together before you drawing anything. 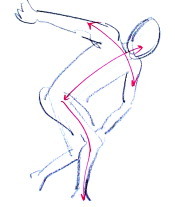 Limit the time you use for each gesture drawing. It can be as short as 10 to 30 seconds or as long as five minutes at a time. Short gesture drawings gets your creative adrenaline going, and helps you learn to quickly identify the essence of an object without getting caught up in the details. If necessary, use a timer and see what you can accomplish in 1 or 2 minutes. At first, it might not seem like enough, but with practice, you will become more efficient. Ignore any lines you lay down which are not 'accurate'. Just keep going. If needed, you can always come back to erase the lines you do not like after you finish. Keep the momentum going. When holding your drawing tool, don't just draw with your wrist. Move your arm swiftly and steadily. Doing so enables you to create lines or masses that are more dynamic instead of timid and weak. Use the tip of your drawing tool to create swift lines. If there is one, you can use the broader side to create more solid-looking regions. Use both approaches as needed. The charm of doing gesture drawing is that you can do it everywhere you go: in a park, a coffee shop, or any place where you can stop for a moment and observe people discretely. You can also use inanimate objects for your models. You don't need a lot of time and space with gesture drawing; have fun with it, and enjoy the spontaneity.